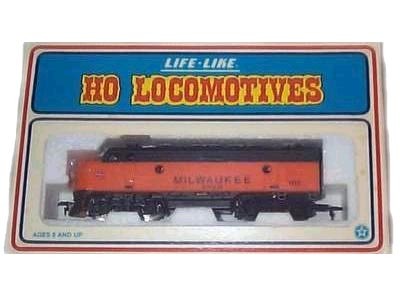 Life-Like’s name in the hobby expanded into a full line of HO-scale model trains in early 1970. Life-Like’s Sol Kramer had purchased Gordon Varney’s company in the 1960s, but Varney’s name remained on model trains into 1970. The F7A and companion F7B served in two lines prior to Life-Like. The tooling originates with Penn Line and dates to around 1960. The model became Varney’s standard F-unit by the mid-1960s. This F7A model moved to Life-Like’s line in 1970. The original Life-Like catalog presents this F7A in three train sets, as well as listed as a separate sale diesel offering. Life-Like’s 1970 catalog includes an F7B in the consist of the Cannonball Diesel Freight with a Baltimore & Ohio pair illustrated. That Cannonball set shows availability also in Chicago & North Western and Santa Fe. No separate sale F7Bs appear in the 1970 catalog. The F7A is listed as #770 and sold for $11. For 1971’s catalog, Life-Like revises stock numbers on the F-units and the catalog presents a “T233” series number for the model and $11 retail remained. The price list included with the HO-Scale Trains Resource copy of Life-Like’s 1971 catalog shows the various powered F7As, but no F7Bs are present on the list, though the Cannonball set appears in the catalog with B&O and Santa Fe examples showing B-units. 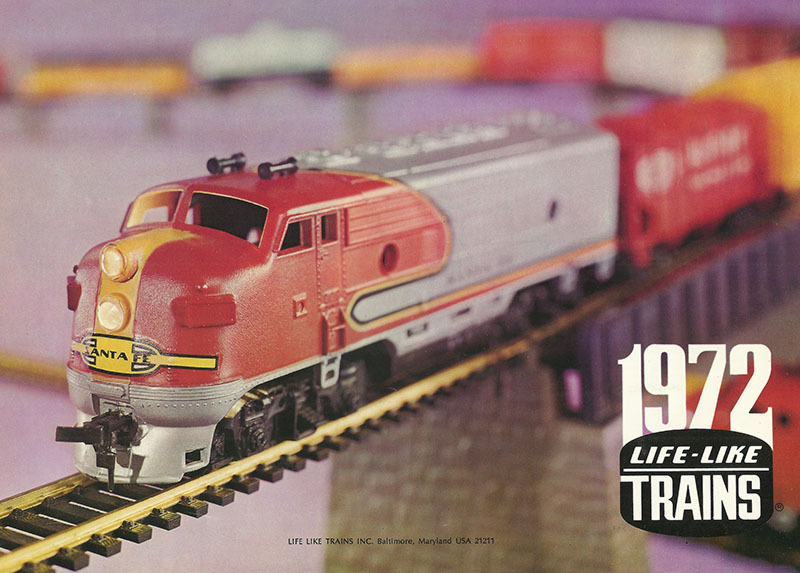 Life-Like’s 1972 catalog presented a Santa Fe red-and-silver Warbonnet F7A on its cover. Newly listed road names for 1972 included Burlington Northern, Canadian National, Canadian Pacific. For 1974, Life-Like revises stock number and the F7s move from “T233” series numbers to “08314” numbering. Attempting to use numbering provided in catalogs to identify models can be a challenge and Life-Like’s listings prove no exception to that rule. Often generic or basic body numbers appear in catalogs and specific or individual stock numbers for each road name is not included. 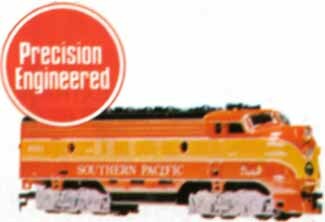 The model appeared as a powered A-unit among 1974’s diesel locomotive and carried a $14 suggested retail price. 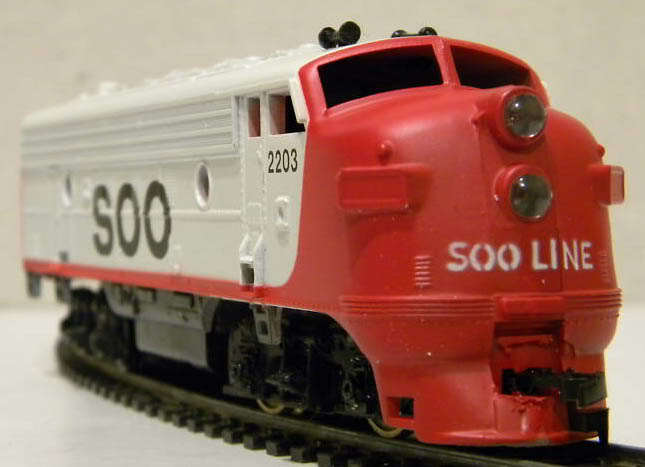 A red-and-white Soo Line F7 is a new listing for 1974. In train sets offerings that year, the Cannonball set remained with a B&O F7A and non-powered F7B and Life-Like shows a Coastal Express (#08136) set with a powered and non-powered F7A pair in Santa Fe colors. 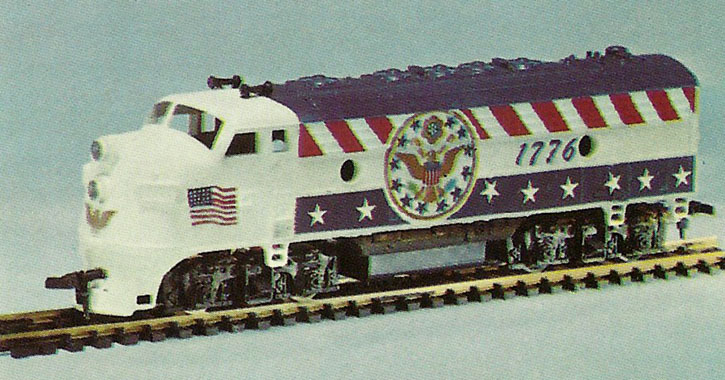 Joining the U.S. 200th birthday Bicentennial models that proliferated in the hobby in the early-to-mid 1970s, Life-Like introduces a red, white, and blue “Spirit of ’76” F7A in 1975. 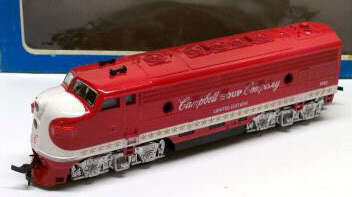 New in 1975, along with the Spirit of ’76, were Chessie System and Illinois Central Gulf F7s. 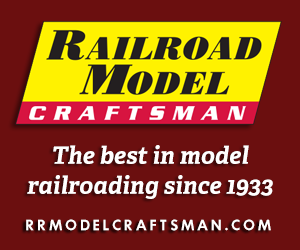 The Spirit of ’76 and Illinois Central Gulf models are only known to exist in A-unit offerings, while the Chessie System included F7A and F7B offerings. For 1976, Life-Like lists an Amtrak F7A among its offerings. This new Amtrak diesel is included on the point of Life-Like’s Midnight Special (No. 08762) train set. The model featured Amtrak’s Phase II paint scheme with red-and-blue horizontal bands surrounding the center portion of the silver body with black roof. Life-Like notes F7Bs in 1976’s catalog and lists Burlington Northern, Chessie System, Santa Fe, and Soo Line. The original Burlington Northern F7A included a black roof; later production models included silver roof. The late 1970s saw a number of new road names introduced for Life-Like’s F7A. The 1977 catalog notes new packaging for the F7s, this is the taller box with red lettering outlined in yellow. 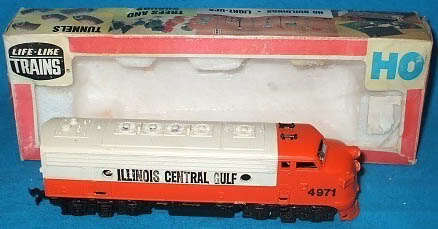 Some collectors call this Life-Like’s “circus packaging.” The new 1977 F7As included Conrail; Gulf, Mobile & Ohio; The Milwaukee Road; Southern Railway; and Wabash. Among the many HO-scale F7 models produced in plastic since the mid-1950s, you can fairly easily identify this version by its stubby stirrup steps. Penn Line introduced this tooling and the image with red-and-white banded box showing a pair of Santa Fe F7As is what the early releases looked like from that manufacturer. Drive mechanisms have undergone numerous changes since the early 1960s. The most recent production of this shell comes from Walthers in Life-Like train sets. Collectors should be aware that in addition to this F7 model, Life-Like imported a Mehano-made Yugoslavia F9A in the early 1970s. This was the same F9A sold by American Train & Track for a few years. I find no catalog appearances for the F9A, but have seen them in Life-Like packaging and they may have served in some train set offerings.